Solar cooling could be an effective way to increase the annual solar fraction of domestic hot water production and prevent the solar system from overheating in summer. Under the aegis of the IEA Solar Heating & Cooling Programme, researchers from Task 53, New Generation Solar Cooling & Heating Systems, have written a new book, titled The Solar Cooling Design Guide: Case Studies of Successful Solar Air Conditioning Design. It includes a detailed case study of two buildings containing offices and flats in Montpellier, France. The on-site 240 m² flat plate collector system powers a 35-kW absorption chiller to achieve a 70 % solar fraction in annual hot water production (see photo). Between November and March, the system continues to provide around 40 % of the heating energy to meet hot water demand. Sizing a solar thermal system for domestic hot water production always comes down to a trade-off between meeting a high percentage of heat demand, also known as the solar fraction, and preventing the collector field from overheating in the hot season, which would lead to stagnation. To reduce waste heat, the system is usually sized to meet all the hot water requirements in summer, thus doing without relevant solar heat contributions in spring or autumn. On the other hand, it is possible to oversize the installation, which would increase the solar fraction throughout the year, and to use the surplus to power an absorption chiller for space cooling in summer. 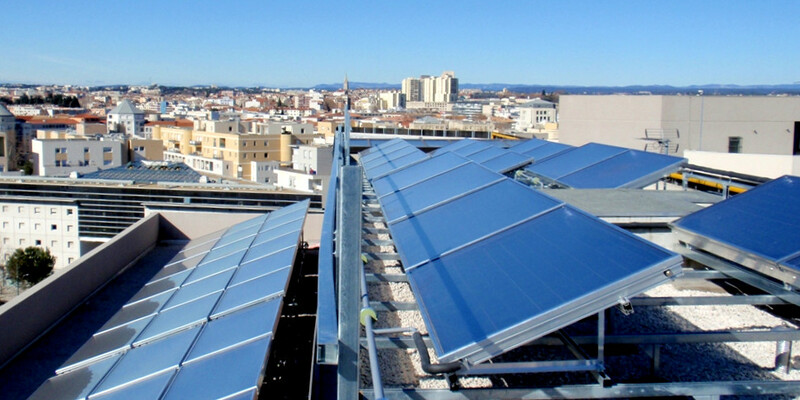 The solar thermal system described in the new IEA SHC book provides hot water and cooling for the offices and flats inside two buildings known as Arche Jacques Coeur (see photo). It was designed by the French office Tecsol to meet the entire hot water demand in May, which results in excess heat for cooling. The solar plant has been working since May 2012 without relevant technical issues and with high reliability. The installation consists of 240 m² of double-glazed flat plate collectors powering a 35-kW lithium-bromide single-effect absorption chiller, which has an operating temperature of around 75 °C. The chiller capacity is small compared to the about 600 kW required for cooling the building. However, the device was not intended to meet most of the cooling demand. Instead, it was set up to make use of the surplus heat that the solar collectors generate in summer. The small nominal power also allows the chiller to be run at full capacity throughout the entire day, resulting in greater operational efficiency. The solar field has been sized for water heating purposes, which means that its specific value of 6.9 m² per kW of chiller capacity is larger than it would have been had the solar system been used for solar cooling only. The increased size, however, means that the chiller could be operated at higher temperatures over longer periods, which will lead to greater efficiency. The system supports two modes of operation (see the chart above). In summer, from the beginning of June to mid-September, it starts in combined mode and heats the “high” temperature storage tank to the level required for powering up the absorption chiller. If the absorption chiller is not up and running by noon, the system will switch to DHW mode, as it is unlikely that the chiller can be operated efficiently. Of course, if the high-temperature storage tank receives more energy than is required by the chiller, domestic hot water can be produced in parallel to cooling. The annual solar fraction for producing domestic hot water is approximately 70 %, and the system meets around 40 % of the hot water demand from November to March. Monitoring data gathered between March 2013 and March 2014 shows that in summer, the installation achieved an seasonal performance factor, or SPF, of 13. This value is far below the SPF of 37 in winter. The SPF describes the ratio of heat delivered to electricity consumed over an entire year. The higher electricity consumption in summer is a result of the power required for the chiller’s pumps and cooling fan. In Combined mode, the average electricity consumption adds up to 980 kWh per month in summer and to only 250 kWh per month in winter. 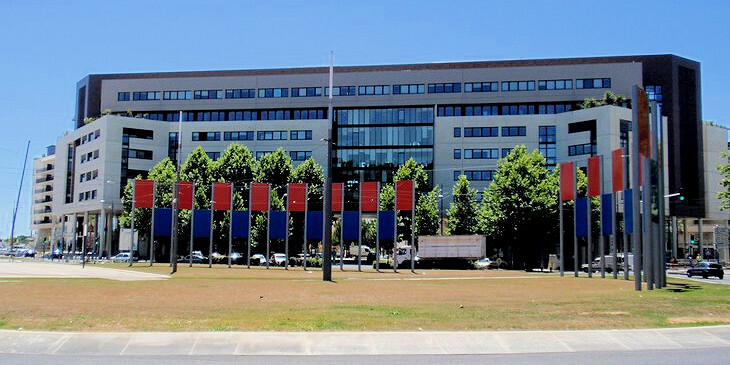 The total investment cost of the solar cooling and DHW system was about EUR 400,000 (excluding 19.6 % VAT) and the installation is estimated to have saved around EUR 6,000 in gas and around EUR 2,000 in electricity each year. However, there are also O&M costs to consider. They amount to 2,000 EUR per year. You can order the book online.